Benicia Motorworks is committed to maintaining the technological knowledge that allows Paulo to be a master mechanic of everything from classic motor vehicles to the newest auto industry technology, and that includes the growing number of Electric Vehicle owners in the greater Bay Area. To help promote the development and growth of EV autos, Benicia Motorworks has installed the first privately owned and operated electric vehicle charging station in Benicia. 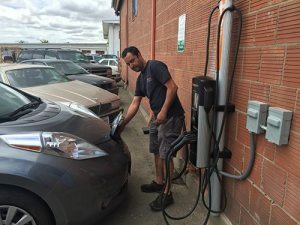 When you need to have your EV serviced or just have some questions about how to get the best performance from your EV, stop by and get a charge and some great advice.